Now that realism is finally permeating dealer groups, fleets and private vendors, cars are selling again at auction, but at much lower levels than anyone would have predicted a year ago. 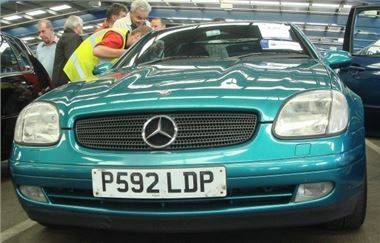 The SLK in the photo was a 97P, so eleven years old, and had done 111k miles, but £3,650 is unheard of money for these cars. About what, in the recent past, you’d have paid for a same age MX-5. In the Sure Sell section a respectable enough 97P Volvo V70 T5 with 179k miles sold for just £550. A 73k mile 2000W Jag XK8 3.2 was a huge amount of car for £2,400, and still only £200 tax next year. A 98S NBW 728i sold for £1,500. But they weren’t all cheap. An 07 BMW 320i E93 Coupe Convertible was reserved at £24,000, yet bid on to sell for £25,000 to an independent retailer. So there’s still money to be made from people with plenty of real cash in the bank. Here’s the list. As usual, ‘s’ means sold. ‘p’ means top provisional bid, ‘pc’ means provisional, but close. ‘n/s’ means not sold. ‘n/w’ means miles not warranted. ‘MNW’ means unknown mileage. ‘dmg’ means damaged. ‘fl’ means facelift. ‘s/r’ means sunroof. Fleet and Finance, Motability Barclays Asset Finance, Lex, Porsche p/x, Mercedes Benz Retail p/x, Inchcape no reserve p/x, Ridgeway VW p/x, Hartwell p/x, Pendragon p/x, Franchised dealer p/x. Fleet and Finance, Sytner p/x live online, Leaseplan live online, Lex, Jardine p/x, Black Horse, Masterlease live online, Multi Source, Inchcape p/x, Snows Group p/x. Lloyds TSB live online, Masterlease live online, Motability, Fleet and Finance, Charters p/x, ALD Automotive, Lex live online, Hitachi CVS live online, Leaseplan, Multi-source, Eden Group, Inchcape p/x, Private Sure Sell. Fleet and Finance, Motability Barclays Asset Finance, Lex, Porsche p/x, Mercedes Benz Retail p/x, TOP CAR, Inchcape no reserve p/x, Ridgeway VW p/x, Hartwell p/x, Pendragon p/x, Franchised dealer p/x. Lloyds TSB live online, Leaseplan, Motability, Lex live online, Fleet and Finance, Charters p/x, British Telecom Fleet live online, Vauxhall Leasing live online, Masterlease live online, Hitachi CVS live online, Multi-source, Eden Group, Inchcape p/x, Private Sure Sell. BCA Peterborough stages Motorbike sales on the last Friday of each month, with high volume Super Sales featuring ‘bikes from Black Horse every two months. (Next Super Sale on 25th August). Sales start at 1pm and all are welcome to attend. There is secure motorcycle parking on the day and an expert and enthusiastic Sales Team on hand to answer questions. Viewing is on the morning of the sale and BCA can arrange transport to anywhere in the UK.